Offering you a complete choice of products which include motor cycle bullet. 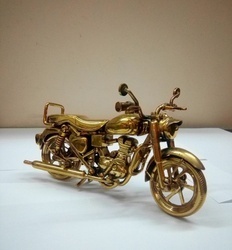 This Royal Enfield - Bullet motor cycle is made in brass as a collectors piece. A must possession by all persons who love to collect such rare products. Beautifully made by our expert artisans is this unique motorcyle speacially for art lovers.